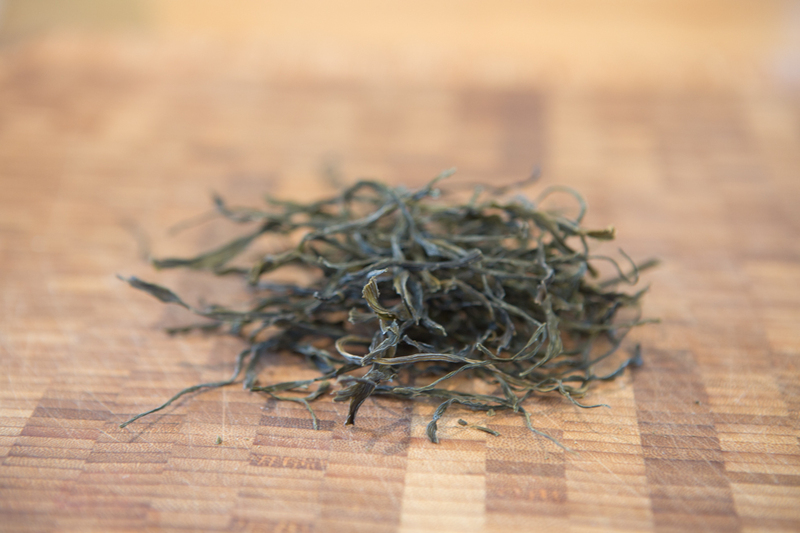 The sea can be very generous in terms of providing food sources, none healthier than seaweed. Making this Seaweed Sauerkraut recipe ( I like to call it Sea Kraut) is a wonderful alternative to standard sauerkraut. There are many kinds of seaweeds and in my experience, they are mostly all delicious. Living close to the ocean in Northern California, I’ve got quite a collection of locally harvested seaweed, but for those of you without easy access, seaweed can be readily purchased online and in your local healthfood store. Personally, I love this Sea Kraut recipe. I love the hints of the sea mixed with the tangyness of the fermented cabbage and the toothiness of the golden beet. It’s a perfect combination. I prefer the golden beets simply because red beets tend to tint the entire mixture and I like seeing the different hues of this one. 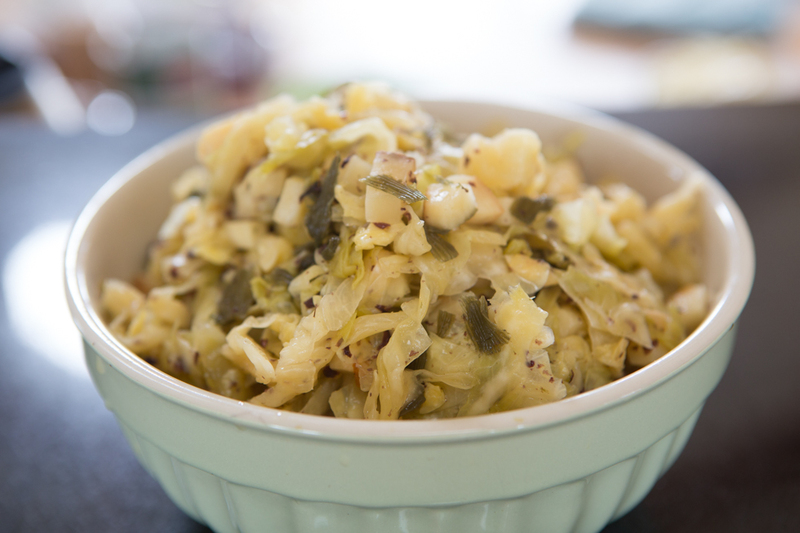 I’m sure you’ll enjoy this delicious Seaweed Sauerkraut recipe. Prepare the cabbage - Fresh organic cabbage is always best as the water content in the cabbage tends to be higher. Clean the outer leaves or peel and toss them if they have spots. Quarter the cabbage and then cut it into thin ribbons, excluding the most dense part of the core. Prepare the Seaweed - Take the dried sea palm and dried dulse and cut it into small pieces. Exact size doesn't matter, but it will expand as it rehydrates so smaller is better. 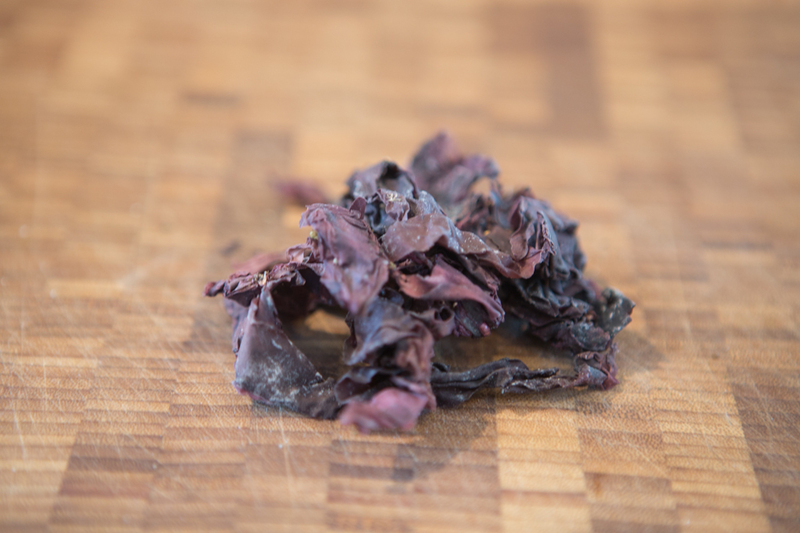 Mix all ingredients and toss with salt - Place the cabbage, beet and seaweed into a large bowl and toss with the salt. Mix well to distribute the salt somewhat evenly. Allow to the vegetables to sweat - Leave the vegetables in the bowl until they begin to sweat and liquid pools at the bottom. Use your clean hards to squeeze the cababge in order to help break down the structure of the cabbage a little. Place everything in fermenting vessel - Take all ingredients from the bowl including the liquid which may be pooling at the bottom and place in your fermentation vessel. For this recipe, I used a 1 gallon Anchor Hocking cookie jar. I often use a fermentation crock like this one. Since making this, I've switched almost entirely to using fermentation crocks or airlocks. For airlocks, I prefer the Mason Tops Complete Mason Jar Fermentation Kit or the Recap Airlock and Stopper. Compress - Compress the ingredients in the vessel by pressing down gently with your fist. Your goal is to compact everything and have the liquid rise to cover the ingredients. Place a weight on top of the ingredients. If you use a fermentation crock, then it should come with its own weights. If you use the glass jar approach, I'd suggest filling a plastic bag about 2/3rd full with water (be sure it doesn't leak first) and placing that on top of the veggies. 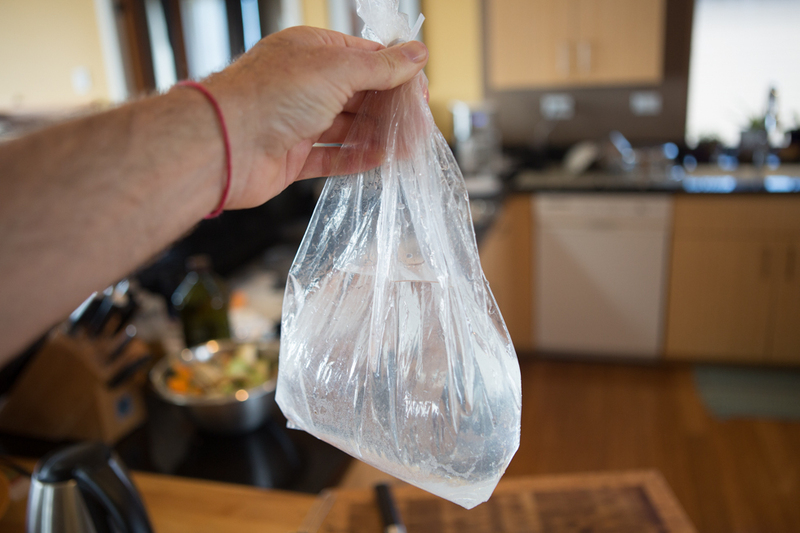 Best to remove the air from the bag when sealing it so that the shape of the bag can conform easily to the sides of the jar to form a good seal. Be sure liquid covers the ingredients - If the liquid doesn't yet rise up sufficiently to cover the vegetables, don't fret. Just give it some extra time, perhaps up to 4 hours. Compress again. If the liquid still doesn't cover it, give it another 4 hours and compress again. If the liquid doesn't yet rise to cover the veggies, you can add a little water, perhaps 1/2 cup of so. If you do so, it's important to mix the entire mixture well so that the salt is well distributed throughout all the liquid. The more fresh your ingredients are, the more liquid will naturally leach from the veggies. Cover - The point of covering it is to keep germs and molds from entering your ferment, while still allowing the ferment to breathe. The plastic bag forms a good seal in this case, but cover with a cloth as well. You can use an airlock for this as well. Wait impatiently - You can start tasting this one after a week. Personally I left mine for nearly 3 weeks. It generally comes down to taste with ferments. When it's pleasingly sour and has a bit of an alive zing to it, it's ready. Refrigerate - This helps to significantly slow the continuing fermentation. Seaweed Sauerkraut is of course good when paired with Seafood. You could top fish with it, or serve it as a small side salad. It’s also nice with a Vietnamese salad, perhaps served on top of brown rice. I love this one so much, I generally eat my Sea Kraut straight from the jar when nobody’s looking! Love all types fermented veggies… never thought of combining these ingredients. This looks like a commercial seakraut that is really great. Can’t wait to try it. 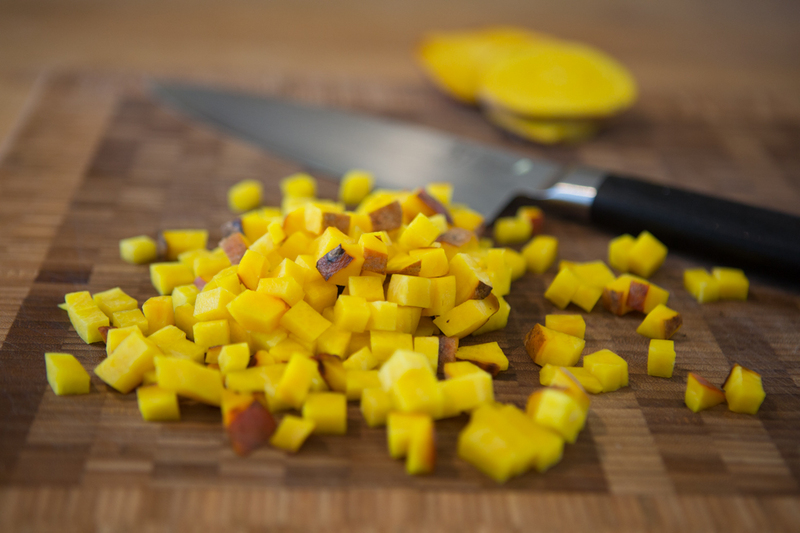 Wondering if there is a good substitute for the golden beet? They are not that easy to find where I live. There is a lot of flexibility in fermenting recipes. Go on and get creative and see what happens. You could omit the beet entirely. I might try small cubes of daikon radish as a substitute. Regular red radish would work too, but would impart a little pinkish color to the overall ferment. Thanks for the reply. I tried a parsnip as a substitute for golden beet and I also used just the Dulse seaweed as that was all I could find. It turned out great. Awesome! Great suggestion on the parsnip. I’ll try to work more parsnips into my recipes. I’m totally new to fermenting. 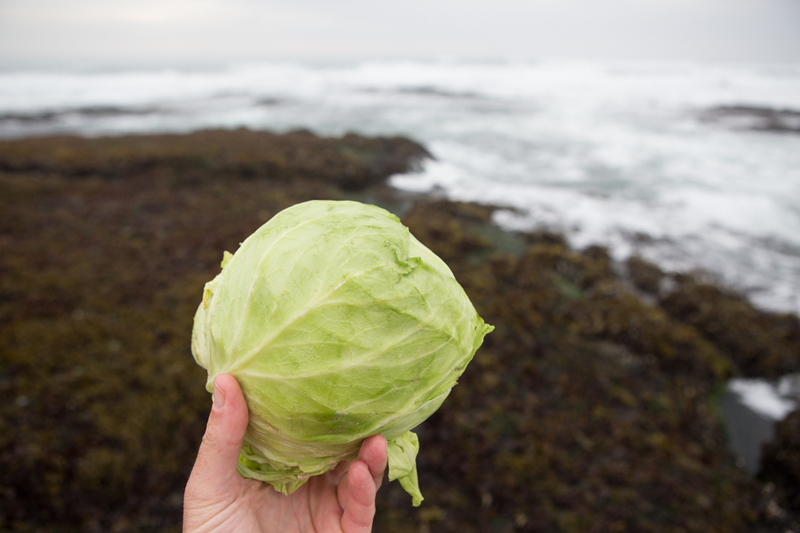 I love sea vegetables and will be making the Sea Kraut. 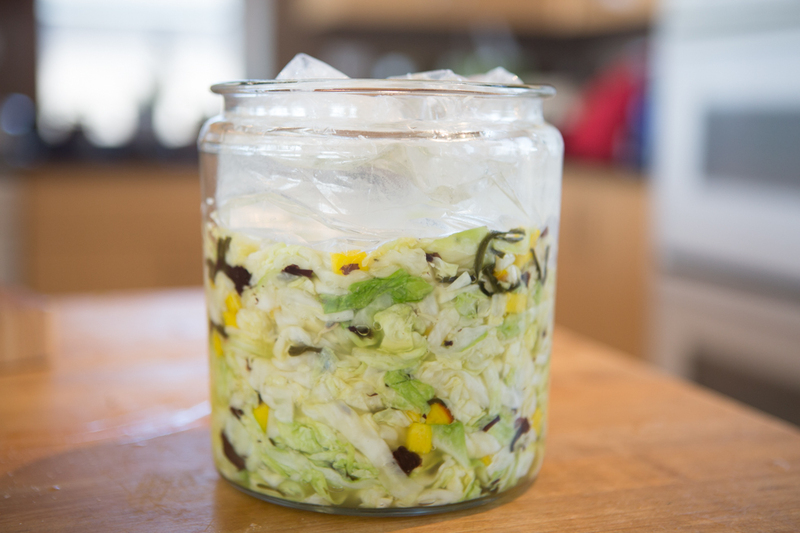 When I pack fermented vegetables into mason jars, how long can they be kept on my pantry shelf? Months or years? You really can’t keep feremnted goods on your pantry shelf in mason jars. When foods ferment (and your ferments will continue to ferment after you place them in jars, they release gasses which will put more and more pressure on the jars/lids. I always store my ferments in the refrigerator once I jar them up, which significantly slows the fermentation process to the point where expansion doesn’t seem to create much of a problem. In my experience, in the refrigerator, ferments will keep almost indefinitely. They will continue to get increasingly more sour with time. Use your judgment (and taste of course), but if it still seems good over months or years, it probably is.